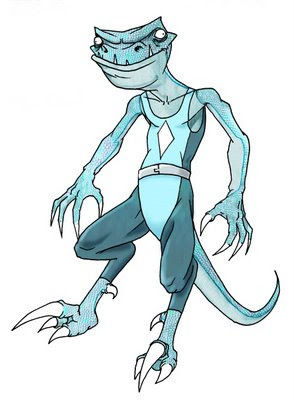 Ice Raptor is part of the WOE, which is a group of super villains dedicated to destroying all Super Heroes. This group was created by Austin Maddison: Check his site for more WOE action. Doug Vansant was a live in land lord of a San Francisco East Bay Slum were no one wanted to live. Unknown to him, there was an unscrupulous genetic engineer that was in hiding living in the apartment above his own. Adjacent to the genetic engineers apartment resided a low life that operated a Meth Lab. One day when loud noises where coming from the apartment above Doug's, he went to investigate the clanking. As he was reprimanding the engineer he happened to see some odd equipment: viles of liquid, large eggs, petrified bones, and computers. A minute later there was a giant explosion. The apartment was leveled but from the ashes rose Doug transformed into a hideous beast. Mysteriously during the explosion the chemicals of the methamphetamine meshed with the DNA of both Doug and a Velociraptor. What resulted was a half-Raptor-half-man creature with Amphetamines infused into it's DNA. Never sleeps, moves incredibly fast, super strength, works well with a team, poisonous saliva (equivalent to injecting 1000 cc. of uncut Meth), razor sharp claws and teeth, and ability to stay focused for extended periods of time. Will do anything for a cigarette, prone to vacuuming at 3 A.M., twitchy (can't stay still, which is bad for hunting), tends to jump the gun, always paranoid, Kleptomaniac leanings and other bizarre phobias. Doug was an amoral Slum lord; I will leave these weaknesses to your imagination. Apparently I was a bit late with this. Check out Everitt Downing's and Emma Coat's characters too. Holy crap, that's awesome! I love that his bite is a meth-overload. I can already picture his nemesis, E-Rex. Ha, Ha! E-Rex, too much. Just mentioning a methlab wins you some fat points. The fact that it's infused with his DNA... well, what can I say: Market St has at least several dozen examples of that on any given day. I also really dug on the Pale illo below. I'd dig on having a print of that. Very interesting character build. Love his colors and fangs, not to mention his talons!